As the month comes to a close, from a technical perspective, global equity indices have made solid progress in February. Around half (12) of the 23 country equity index, ETFs that we track in our Global Macro Dashboard managed to take out their respective 200-DMAs this month. These country indices broadly bottomed around the same time last year and have been steadily climbing since with some surpassing the 200-DMA more than others. For example, Italy’s FTSE MIB and France’s CAC 40 have just barely moved above while China’s CSI 300’s has surged past. Meanwhile, Spain’s IBEX may not have necessarily started the month below, but it has seen constructive movement during, bouncing off of its 200-DMA. Global indices taking out these resistance levels—or for the case of Spain finding it as support—helps to provide some reassurance to the strength of the rally around the globe so far in 2019. 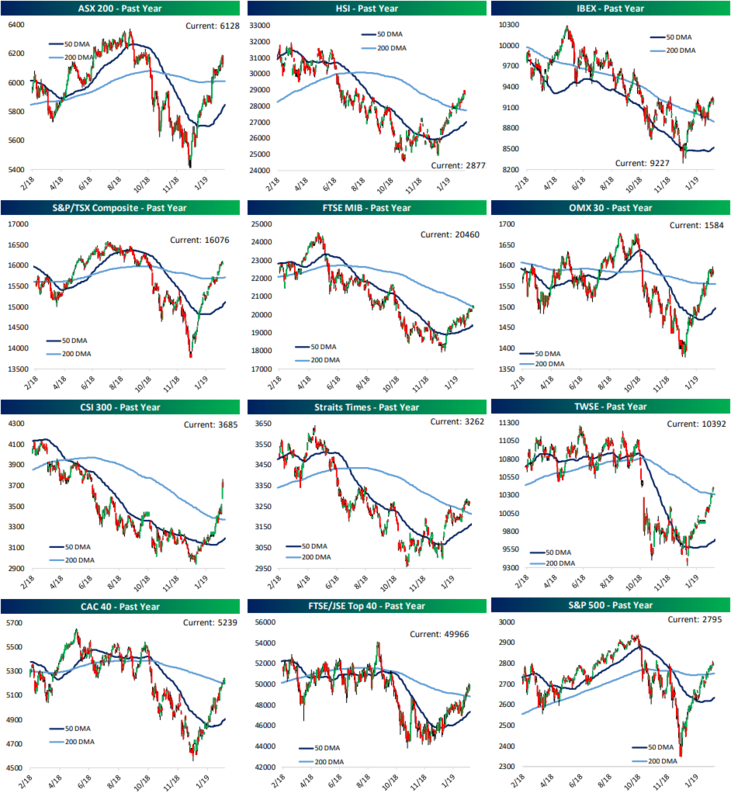 Whereas for the better portion of 2018 some of these indices remained in downtrends, the current rally is a nice reversal. Granted, equity market performance certainly does not entirely negate the concerns around weaker macroeconomic data from a number of these countries, some of which can be seen in our Global Macro Dashboard, but it does help give a reason to not head for the exits as a result of global slowing just yet.